A couple of Sundays ago myself and two friends were invited to attend a church service at City of Israel Church. 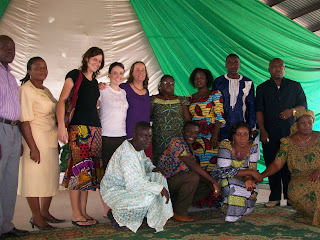 Emmanuel, a translator on the ward, had a taxi waiting for us outside the port gates and took us to his church in Togo. The City of Israel church building looks like many of the churches that I have seen since being in West Africa. 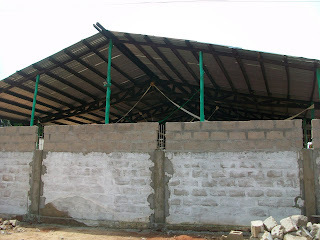 There is a high wall to seperate it from the street and a high ceiling supported by posts along the sides. 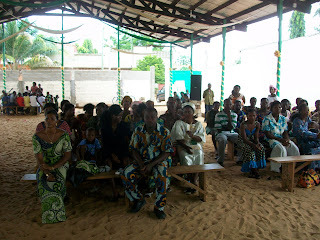 The congregation sit on wooden benches or plastic chairs and there is a platform in front. Pastor Israel invited Kelly, Alainie and I to introduce ourselves and share some words of encouragement. Then we found ourselves in a photo shoot! Several pictures were taken with different people. Here we are with the leaders of the church.